Y'all, I found the most amazing recipe, okay, well it's almost the most amazing recipe but needed a few tweaks. I was looking for an easy Banana Muffin recipe and stumbled across this one at TipHero. Man are they yummy: gluten free chocolate chip peanut butter banana muffins. 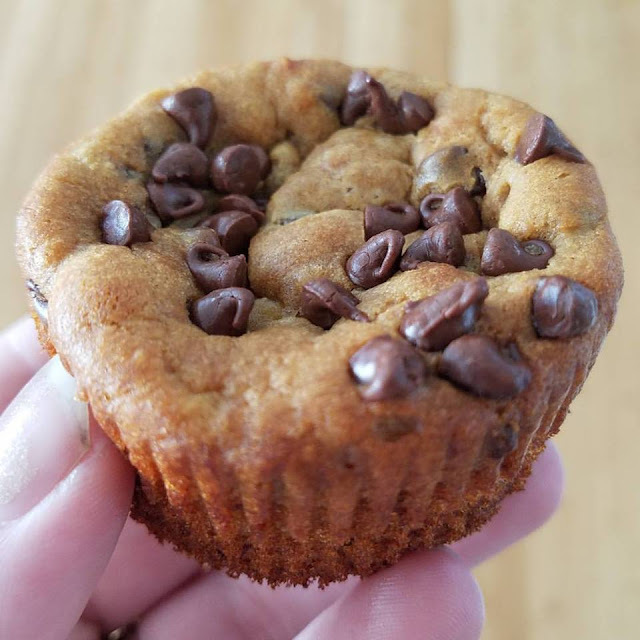 It's a mouthful and while they were super delicious, I wanted to see if I could come up with an allergy friendly version as well, which might even change the taste a bit! First, we made the original recipe. We changed it by doubling the recipe and using the larger size muffin tins instead. I was apprehensive because a flourless wet mixture doesn't look promising but they came out tasting delicious. I wanted to see what I could do about eliminating the peanut butter next. If I can make them gluten friendly, maybe I can make them Allergy friendly too. Sure enough, making them with Wow Butter yielded the same taste and consistency! 2. Mash bananas well in the bowl. 3. Add the eggs, WOW Butter, honey, vanilla, baking soda and salt to the bowl. Mix well until smooth. 3. Stir in the chocolate chips. Reserve some of the mini chocolate chips for topping the muffins. 4. Fill the muffin cavities 2/3 of the way full then sprinkle the remaining chocolate chips on top of each. 5. Bake for 10-15 minutes or until the muffins are brown around the edges. Muffins are done when an inserted toothpick comes out dry. Off to Blogger Bash in NYC!